We use only top-quality industrial-grade wax. Our proprietary application method results in a finish that last up to TWICE as long. Call to reserve a time convenient for you! Renew dirty corners and baseboards! Our skilled, experienced technicians provide the professional results you expect. We stand behind our service. All prices per square foot. Destination and setup fee applies for jobs under 4000 sq.ft. Ask about volume discounts. Furniture moving available at an additional cost. 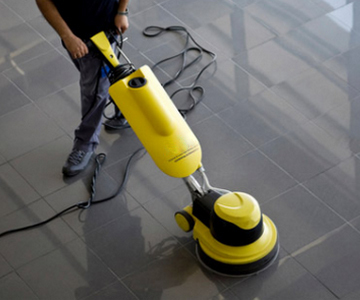 In 1997 we set out to create a better cleaning company. Our vision: offer great value by attracting some of the most responsible and dedicated employees. Today our people are the most important competitive advantage. Respected and empowered employees produce better results. While our competition struggles with constant turnover, security issues and inconsistency of service we have become the go-to company for those seeking to run their business, instead of managing emergencies.